Vehicle-building legend Sariel is back! After three years of development Sariel has revealed his latest model, and what a model it is! The exterior is a beautifully realistic Model Team recreation of Kenworth’s T600 truck in sleeper-cab configuration, and would be worthy of an appearance here as a static model alone. But this is far from a static model. Inside that superbly constructed body is a complete sleeper interior and a highly detailed engine. Oh, and more electronics than an Apple Store. Two XL motors drive this near 6kg model, with a four-speed sequential gearbox also controlled remotely (which moves the in-cabin gear-lever as the gears change!). The steering wheel also turns in conjunction with the remotely steered front wheels and the engine turns over regardless of the gear selected for added realism. The seats, cabin doors and even the turntable inside the brick-built microwave (yes, really!) are all electrically powered and remotely operable, as is the all important fifth-wheel trailer hitch, which allows the connection of a huge low-loading trailer complete with three motorised functions of its own. There’s a lot more to see of Sariel’s incredible creation at both Flickr and via the Eurobricks forum, where you can also watch a video of all of the amazing motorised functions in action an see the impressive trailer hitched up too. Take a look via the links above and ready your mind to be blown. Kaizen. The philosophy of continual small improvements first pioneered in Japan by Toyota, is now a worldwide business practice. And thanks to the inherent characteristics of the LEGO brick, it’s a process that builders can apply too. First featured on this site way back in 2013, Dennis Bosman (aka LegoTrucks) has recently updated his stunning Kenowrth K100 wrecker with a myriad of small improvements. 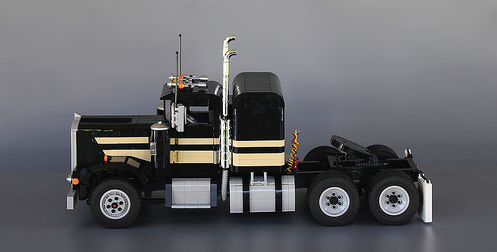 From grey to chrome, standard to dark green, and studs to smooth, LEGO’s continual product development has allowed Dennis to take advantage of an expanding variety of bricks to refresh his beautiful Model Team Kenworth wrecker. There’s more to see on Flickr, and you can check out our interview with Dennis as part of the Master MOCers series by clicking here. But time marcheth on and today 5580, whilst undoubtably still a lovely set, looks a bit basic, both against LEGO’s latest releases and against many of the creations that the online community is building. Cue serial bloggee Ralph Savelsberg, who has re-booted the classic 1988-1990 set for 2016. Based a little more closely on a real truck (the Kenworth W900) and using LEGO’s latest parts, Ralph’s model has grown a bit when compared to the original, squeezing in more detail and looking a lot like the sort of model that you’ll find at a Legoland theme park. There’s more to see of Ralph’s excellent update of one of LEGO’s most famous classic sets at his photostream – click the link above to make the jump. After the Teeny Tiny Trains, we’re featuring a Big Blue Rig. 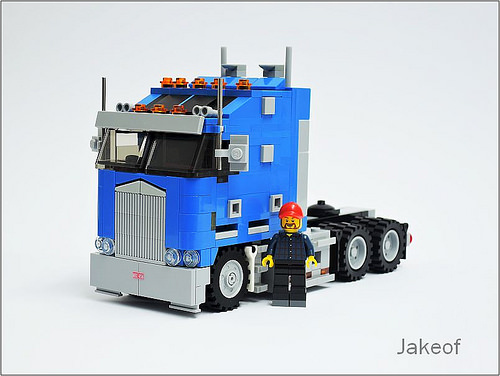 This neat 8-wide truck from Jakeof_, on Flickr. We like the way that he’s used 1x2x2/3 slopes on the front to make Kenworth’s distinctive grille. As noted by Firas Abu-Jaber, this is a very clean, smooth build. It’s so smooth that it actually lacks doors for the driver to get aboard. Then again, that never stopped the Dukes of Hazard! Jakeof_ has finished his tractor unit off with a very nice refrigerated trailer, which is perfect for hauling goods across the Australian desert. This unusually coloured Kenworth W900 was discovered by one of our Elves on Brickshelf. It comes from ‘Grazi’ and it is quite spectacularly detailed, including the engine bay and sleeper compartment. See all the images at the link above. This gorgeous Model Team recreation of the famous 1975 Kenworth 900-A from the cult classic ‘Smokey and the Bandit’ has been built by the recently returned Chris Melby. Chris is working on the trailer too, so expect more in the coming weeks. There’s more to see of the superb tractor unit at Chris’ photostream on Flickr – click the link above to get Eastbound and Down. One of TLCB’s favourite builders, the brilliant Dennis Bosman, is back, and his latest astounding model is already lining up to win ‘Best Truck of 2014’. Dennis took a trip to see the company that owns the real version of this Kenworth K100E Aerodyne, who are oddly enough based in the UK. American trucks are a rarity on European roads and NYR imported their Kenworth K100E from the US especially for their recovery fleet. The cab and chassis were then fitted with a monster Century Rotator 1140, which Dennis has recreated in truly incredible detail. Dennis has published an extensive gallery to coincide with the completion of this model, including close ups, shots of the Century Rotator in action, and photographs of the real UK-based wrecker at his Flickr photostream. Head there now to join us in our amazement by clicking the link above. Dennis has also become The Lego Car Blog’s seventh ‘Master MOCer’, joining the six previous elite builders that make up the exclusive Master MOCers club. Read Dennis Bosman’s Master MOCer interview here, plus you can see all the interviews in the series by clicking the ‘Interviews’ tab of the main menu. One of the few Elves left at TLCB Towers returned today with this; a huge Kenworth T800 Logging Truck. Flickr’s Brickbaron has presented his truck using some excellent outdoorsy photography, something we’d like to see more often here at TLCB. You can check the Kenworth out here. 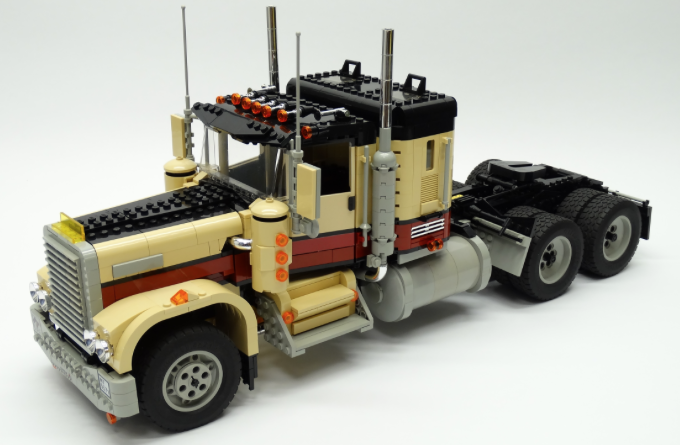 Previous bloggee Maciej Drwiega makes his third appearance in three months here at The Lego Car Blog with this superb 1978 Kenworth K100C Cab-Over Flat-Top. Maciej is rapidly becoming one of the premier truck builders on Flickr, and you can see this and his previous creations via his photostream here. It’s the last day of 2013, so before we all get drunk to celebrate the arrival of another year, we thought we’d end the current one with a bumper haul. Our final post of 2013 contains three superb trucks, found by both the Elves and you, our readers. First up is this stunning Kenworth hay-hauler, found on Flickr and built by Maciej Drwiega. Next is a creation suggested by a reader via the Feedback and Submission Suggestions page, and one we’ve featured here before; Andrea Lazttanzio (aka Norton74)’s excellent large scale Scania 164G. Andrea has updated his model with a huge Nooteboom trailer and has captured it perfectly in several new outdoor photographs. See them all on Flickr or MOCpages. And finally, because good things come in threes and it was also red and white, is Lasse D’s MAN 8×4 cement truck. Complete with Power Functions remote control steering and drive and a rotating barrel, Lasse’s Model Team scale truck is packed with functions and still looks brilliant. 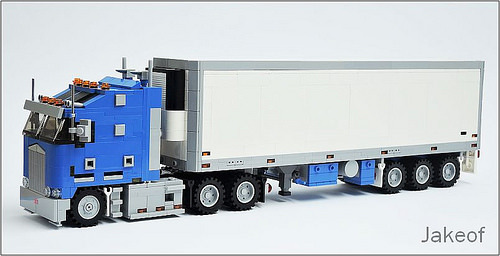 See all the photos and a video of the truck’s features on Eurobricks. And that ends The Lego Car Blog’s coverage of the best LEGO models, sets and news from 2013. Have a great New Year celebration and we’ll see you in 2014! The first Elf re-released after Christmas has stumbled back to the office, and what a find to re-start The Lego Car Blog it is! This huge Kenworth K100C Aerodyne truck is the work of Flickr’s Maciej Drwiega, and it’s one the best truck models we’ve ever seen. You can read the full description and check out all of the pictures here. The Elves are still loving the original Transformers cartoon video they were bought in a moment of unusual generosity by The Lego Car Blog staff, so it’s no surprise they’re on the look out for Transformers-related MOCs. This one comes from Yang Nam on MOCpages, who recreates the original cartoon-spec Optimus Prime in truck-form as a Kenworth K100. See it at Yang’s MOCpage here. This is a Kenworth W900 Heavy Haul truck, and it’s awesome. Custom chrome bricks mean the Elves can see their disgusting little faces in it, and Power Functions motors buried within mean it’s much more than a static show piece. The absurdly talented Sephirot8082 is the builder behind it, and you can see more of this and his other incredible trucks on MOCpages.